Nothing beats the feeling of being valued. The Skilled worker and the white collared employee alike tend to positively react towards it. It solves quite a few workforce related challenges. American workers may be feeling better about contemplating on potential career directions, but most of them aren’t thrilled with their actual jobs. Gallup, a polling and management consulting firm, created a study on the American workplace. According to their study, two-thirds are disengaged at work, or worse. There are approximately 100 million full-time employees, and 51 percent aren’t engaged at work. Meaning they feel no real connection to their jobs, and thus they tend to do the bare minimum. Another 16 percent are “actively or intentionally disengaged”. They are unhappy and they resent their jobs. They tend to gripe to co-workers. This drags down office morale as a result. They may be dissatisfied about the direction of their companies. Sometimes they feel their needs aren’t being met at work. Others don’t fully understand what’s expected of them. 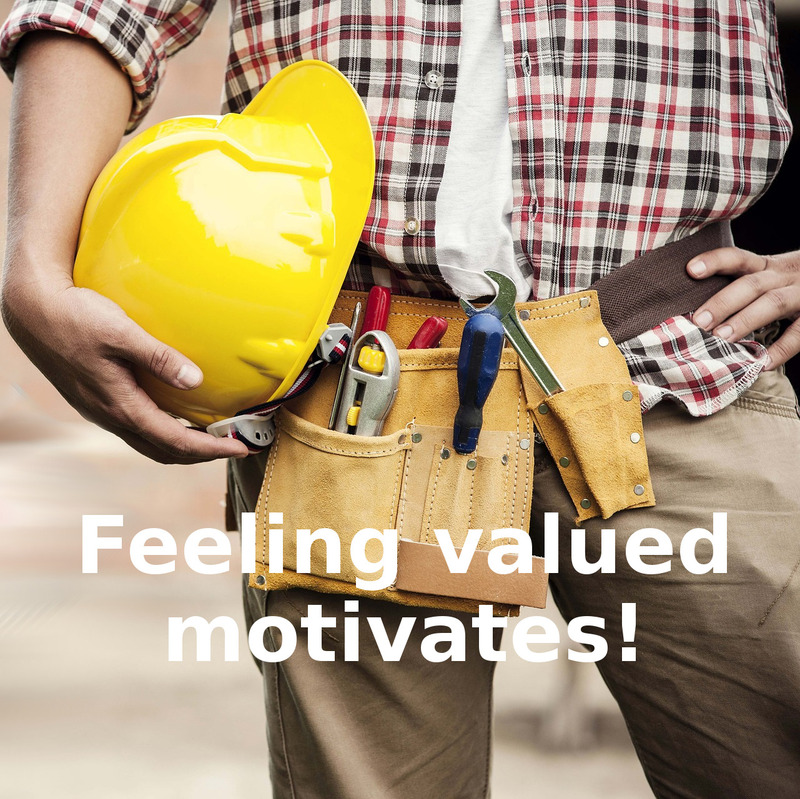 Feeling valued is still the undisputed number 1 in skilled worker motivation. They feel negative about work and the workplace, and are doing more harm than good when they come to work. According to another article I read about Motivation, Dale Carnegie Training and MSW Research evaluated 1,500 employees for engagement in the workplace. They found that feeling valued is the basic emotion that leads an employee to be engaged. That is why any company who wishes to resolve the issue of turnover rate or reinvigorate its workforce’s performance, should find ways to get employees to feel more valued. Feeling valued is important to anyone’s self esteem. This is very true for skilled workers who put in more physical work. They very much depend on this one thing in order to feel validated and content about having acquired a strenuous work position. Team huddles or those small sessions of team-building after working hours is a good way to promote camaraderie at work. Most employees feel good about working their jobs because of the people that they work closely with. The U.S. Department of Labor Bureau of Labor Statistics states that more than 2 million Americans are voluntarily leaving their jobs every month. Meanwhile, a recent study by Accenture attributes 35% of “Quits” to Internal Politics. Indeed bad internal politics take over some companies and cause pain and frustration among the workforce. Actually, managers have the power to abolish an individual’s or cliques counterculture such as negative agendas, attitudes and behaviors that pit against other workers. Be keen to identify the issues and spot early formations of negative politics and then act boldly to declare it unacceptable. Confront it order a cease and desist to any untoward politics taking place at work. Make it crystal clear to the entire workforce that the company is establishing a culture without disruptive politics and that this norm is non-negotiable. Employee of the Week or Month is an old strategy that motivates employees to perform even better. The idea is giving it a brand new twist is by awarding tokens such as a printed version of the post or an object to represent the award. A manager can choose any material to represent the award (button pins/ sticker/ ref magnet or any inexpensive material to symbolize the recognition) and then handing it out to the awardee. In the construction industry, men go to work and at the end of the day go home to their families physically exhausted. So a great way to boost their motivation to go to work the next day is to have a board at home pinned with their achievements or collection of recognition achieved at work. Upon completion, share the project photos to the men who worked on it.This is equivalent to giving them something to beef up their portfolios serving as personal inspiration. Give your men something to brag about with his friends. Contrary to the notion that portfolios are only to used to increase employability, they also can solely for the purpose of making one feel happy, content and accomplished working for you. Feeling validated and recognized is one of humanity’s vanity which can be sparked for a good purpose. Collecting proof of a job well done justifies the hard work and the empathy towards the companies goals. Strategies like this is a simple and inexpensive compensation already. Being generous in giving praises to your front end employees can be a good company culture. For this to be implemented, supervisors must be thoroughly oriented on employee motivation as they are the ones who can extend the inspiration directly to front-liners. Mostly this is solely the digression of supervisors whether they want to frequently praise their employees or not but making it mandatory is the best way to elicit employee motivation. Supervisors are not all the same. Some are perceived as great leaders, but lets face it, some are viewed as the reason why our employees are feeling low on morality and opt to leave our companies. That’s why it doesn’t matter if we CEO’s are good guys if our supervisors are jerks to our employees, we will keep on having a high turnover and low performance rate. Coaching is quite trendy these days. A skilled worker may regard career coaching as a fancy privilege meant for the white collared employees and businessmen that’s why carrying out coaching sessions for your group of skilled tradesmen can motivate them. It is quite easy with all the resources on the internet regarding personal developments and can be done by the supervisors monthly to a few times in a year. Allowing our men to figure out strategies that they are most comfortable with is empowering. Welcoming their opinions, testing their suggestions and changing the procedures in accordance to what was determined to be more effectively done by our men would instill a certain pride in their ability to contribute more than just what’s stated on their job descriptions. One example is Wholefood’s culture of giving power to their people. Their employees are encouraged to submit their ideas and it’s not just lip service – they actually use them. For example, one of their best-selling products, Seeduction bread, was a recipe that a Santa Fe employee created. Before raising pay grade, before promoting to a higher level of position, there are skills upgrades that can elicit the same feeling as promotions do. Such skills upgrade can follow tools upgrade or machinery upgrade and allowing or helping our skilled men be up to date with both technical and non technical skills is very rewarding. A company who allows their employees to grow with them is worth working for. Keeping them skilled with the latest technologies gives them a certain pride in being a part of the company. As you can see there are many inexpensive ways to foster the feeling of being valued, motivate skilled workers and get them engaged in the company’s goals. CEOs, Managers and Supervisors shouldn’t feel burdened by the extra efforts: he or she may pick one at a time. The motivational strategy/ies that you decide should interest your employees or you may get creative and figure out some more ideas of your own.